Vertigo is a specific type of dizziness. It is quite different than the feeling of being a little off balance or the feeling of getting dizzy when your blood sugar goes to low. Symptoms of vertigo can be very extreme, and debilitating for some. There are multiple causes of vertigo, so determining the actual cause is key. Treatment depends on the cause of vertigo. If any of these factors are present they can contribute to vertigo. Imbalance in the bite (occlusion). Any imbalance in the bite can cause dysfunction in the cranium, and how the bones move. This is important because of the forces that go into the temporal bone. 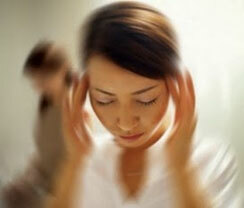 Stress, in particular emotional stress can be a trigger for vertigo.